If you know me at all, you know that I’m a sucker for watercolor. It’s free, expressive, unpredictable, and creates completely unique effects. And brush lettering is one of my favorite hobbies, being that it’s so easy to pick up and totally addictive. And you know what’s even cooler than either of these? Both of them together! I’ve had a blast playing with watercolor calligraphy in my bullet journal, so I thought I’d show you some of the basics so you can join in on the fun! This is the foundation of all your watercolor calligraphy projects. If you have thin or poor quality paper, the whole thing is going to look bad. I like using Darice black card stock for my metallic projects and Canson watercolor paper for just about everything else! I prefer using Pentel Aquash Water Brush Pens for watercolor lettering so I can control the amount of liquid in my work. Also, they feel more natural to write with than a paintbrush. But you totally can use a paintbrush if you want! Just get a round one and you’re set. If you’re aiming for something cheap, Prang will do the job. But if you want watercolors with some serious quality, consider grabbing Dr. Ph. Martin’s Hydrus watercolors. I never knew what I was missing until I tried these. They blend 1000x better than cheap watercolors ever could, they’re vibrant, and being in a liquid form makes them ideal for watercolor calligraphy. Seriously, I’m in love. And if you want to put them in a palette like I do, I’d recommend this palette as for an convenient and economic choice. If you love glitz and glam, you need to pick up the Fintec gold palette. These are magnificent, and they’re made with mica pigments (which are used in metallic eyeshadow). You could say I’m obsessed. I prefer “enthusiast”. 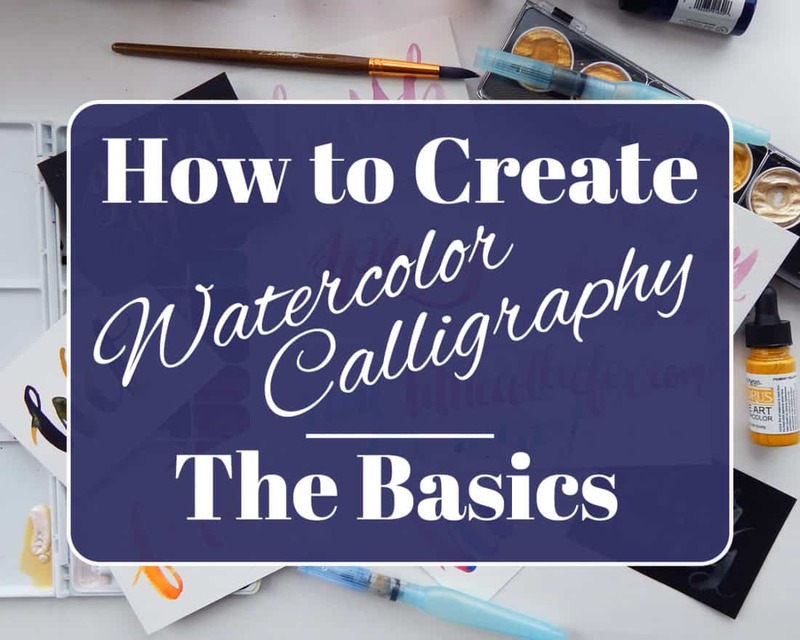 This post is talking specifically about watercolor calligraphy, so you already need to have a foundation in brush lettering. If you aren’t familiar with the basics of brush lettering, head over here for a beginner’s guide to the techniques. Otherwise, we’re charging on! If you’re used to lettering with a flexible nylon tip like on a Tombow, then I must warn you that this is completely different. A bristle-tip brush is a lot more unpredictable and free, and it takes a minute to get used to. With a Tombow, you need to hold the pen at about a 45 degree angle to get those thick and thin lines. But with an actual brush, that’s too extreme of an angle. You’ll lose control of the tip and it will shoot out in unexpected ways, ruining your watercolor lettering. Instead, hold the brush at about a 20 degree angle, or almost upright. That gives you more control over the tip and allows you to manage those unruly bristles. It will feel different for every brush you use, so make sure you practice to get the feel of it! And like I said, this is kinda hard to explain in words. You’ll just have to watch the video to get a better idea of what I mean. Sorry! The next thing to focus on is the amount of water you are using on the page. If your brush is too dry, you’ll get a streaky effect. If it’s too wet, it might be much harder to control – and it takes forever to dry. Neither of these are inherently bad, but they can each be annoying if they are accidental. With a water brush pen, you can easily control the flow of water by squeezing the barrel of the pen. Take care not to accidentally squeeze the barrel while you are lettering, though. To prevent this, simply hold the pen below the barrel and keep a relaxed hand. Watercolor is so excellent because of the wide range of effects you can get by controlling the water. Practice with a very dry and a very wet brush and see what you can create! In conjunction with water, you need to control your pigment. The strength of your paint will depend on how much water you use. Pro tip: wet your paints before starting your watercolor lettering so it’s properly activated and you don’t have to pause your rhythm. If you have very little water in your palette, your paint will be brighter and more condensed. If you have lots of water, your paint will be more watery – kinda goes without saying, doesn’t it? One of the best parts of watercolor calligraphy is the ability to create nearly any color, depending on your palette. You aren’t restricted to whatever colors you can buy. Just mix them and create something new! You can mix in your palette or on the page with your lettering. Start lettering with one color, pick up another, and see them mix in the words on the page. Neat! The wetter your lettering, the easier this technique becomes. 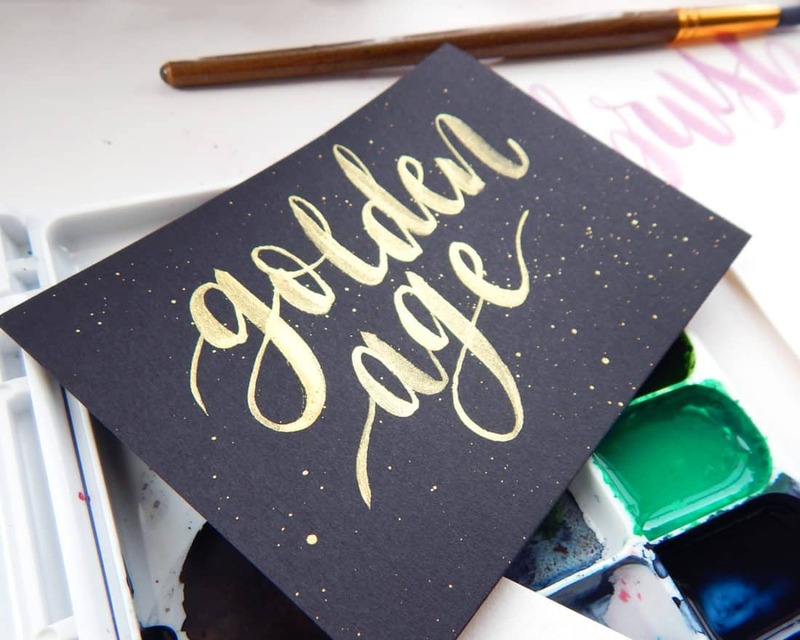 Those three little tips will help you tremendously as you explore watercolor calligraphy. The truth is that you really need to roll up your sleeves and get in the action to get a good grasp on the techniques. If you want to practice your basic letters and strokes, there are some calligraphy worksheets in the Fox Den Resource Library! As you work with watercolors to create your lettering, remember to let loose and play. Watercolors are wonderful because of their freedom. It might be difficult to control at times, but the best watercolor effects come from the medium’s unpredictability. Don’t restrict yourself to any one thing – experiment, have fun, and you’ll find that you can create something amazing. P.S. If you sign up to the Fox Den Resource Library right here or in the sidebar, you can get access to all of my free lettering printables! Go grab them now and practice practice practice! « Check Out the New Fox Den Resource Library! Nice! I just got my water brush today, excited to try! You’re going to love it, Celeste!